Letter from Aberystwyth | Thirty years ago I came over the Cambrian mountains. I am still learning about this place. 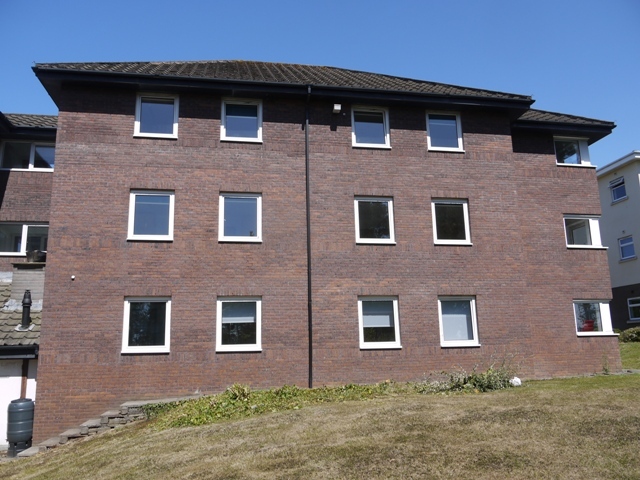 I googled the Penglais Campus today and found a link to its Investing in the Future campaign of refurbishment. 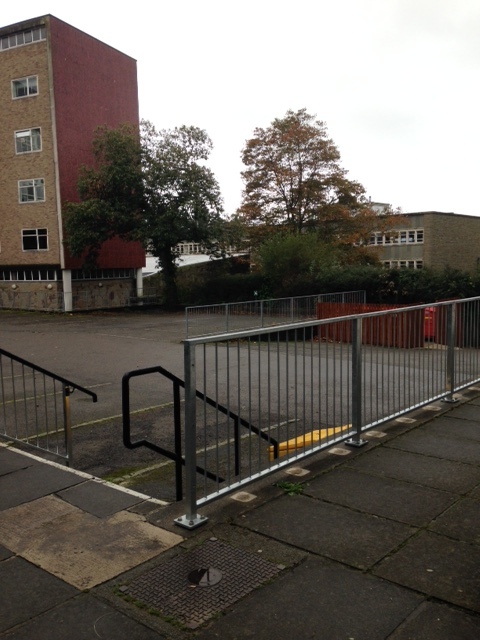 The first line reads “Penglais Campus has benefitted from extensive refurbishment over the last year. Keep checking this section for more developments in the near future.” But when I clicked on it this is all I found. Embarrassing is indeed a good word for what has been done to the campus in the last two years! to a gulag with weed trees in the foreground, and vistas of bark and turf. 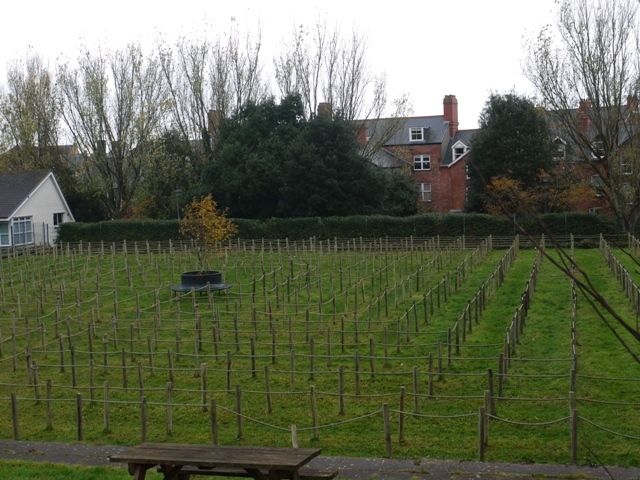 Other major losses to the important Cadw II* listed plantings have been described in this blog over the last 18 months. 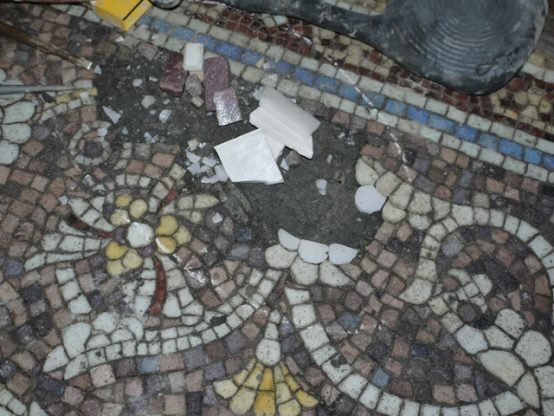 Its historic character is being steadily and unnecessarily whittled away. 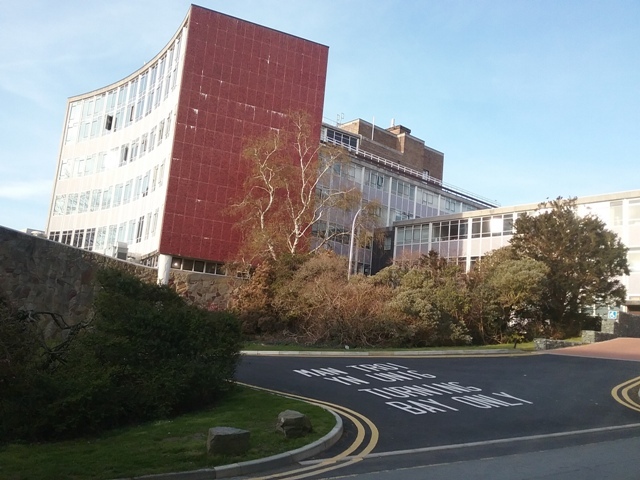 Another loss has just occurred in association with the car park which occupies a space between Computer Sciences and Physical Sciences and is being radically reconstructed. 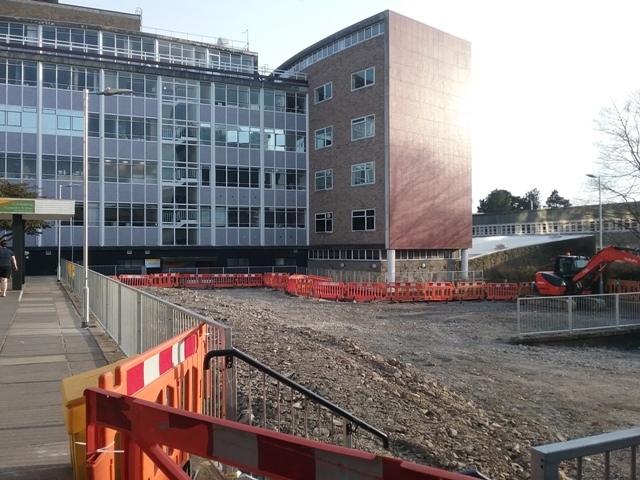 Refurbishment of the car park underway between Computer science and Physical sciences buildings. 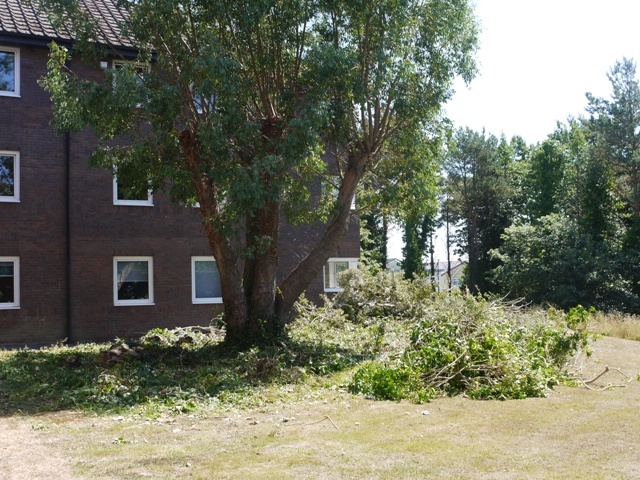 The Sweet Chestnut which stood out so handsomely against the red wall of the Physics Building has been cut down. It adjoined the car park, but was not in it. The stump stands, outside the contractors’ area today. Once again the decisions about “Improvement” are being carried out without attention to the landscape significance of the site. 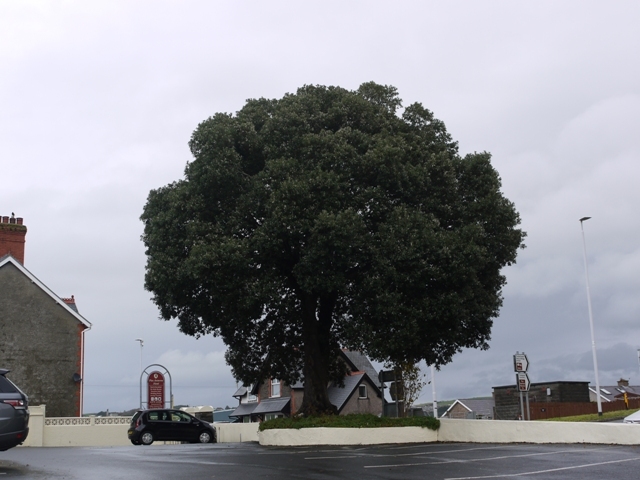 The Sweet Chestnut ( left hand tree in picture) in October 2017. In spring and summer the bright foliage gleamed against the plain red wall. Plantings were created by thoughtful horticulturalists to complement this architecturally striking building. On the other side there is a fine border and a birch, ( safe but for how much longer?). This view was formerly framed by a lawn on which happy students were often photographed for University brochures. Was it really necessary to sacrifice so much of it for the giant lettering on the huge turning area which serves the users of two disabled parking spaces? I took a visitor around the campus on Saturday, and across the road from this she spied the entrance to Biological Sciences. Could those really be PLASTIC PLANTS? Perhaps the people in Biology are doing irony. 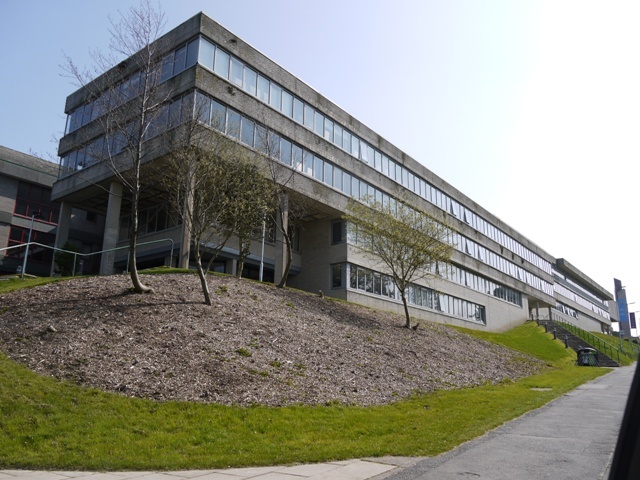 The creation of the campus plantings in the 1960s and 1970s was closely influenced by the expertise of successive professors of Botany working with well-qualified designers and gardeners. 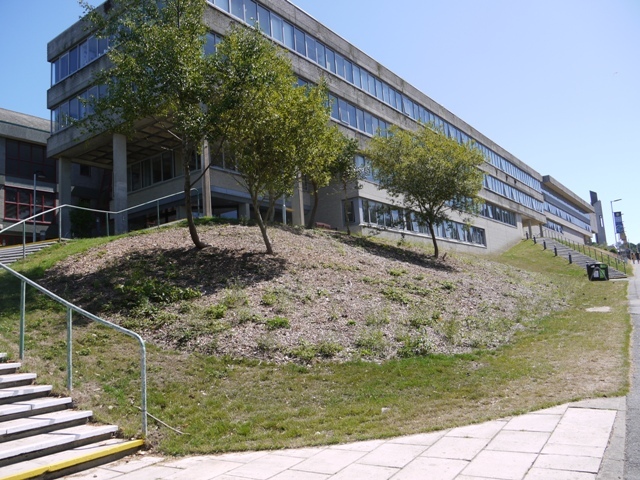 Today, the academic staff have no influence upon their environment, and the University has no Conservation Management Plan, presumably because conservation of a 20th century landscape is not their priority. 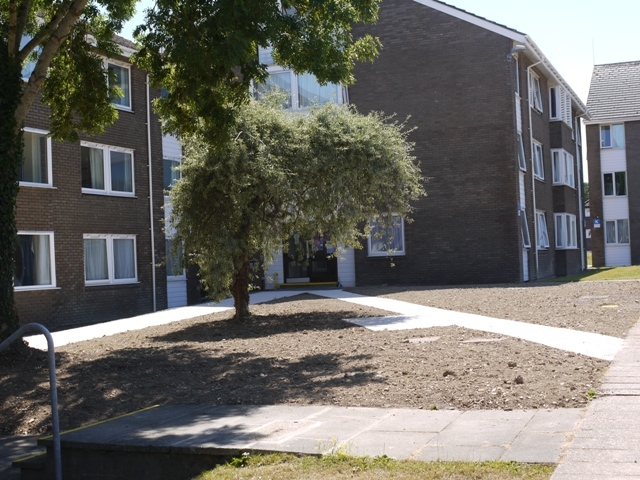 Indeed it was recently announced that the care of the garden landscape of the campus has been devolved from the Estates Department to the general manager of the Sports Centre. Contrast this with the University of Bristol which is custodian of eight historic gardens including a 2009 Centenary Garden, all expertly cared for. 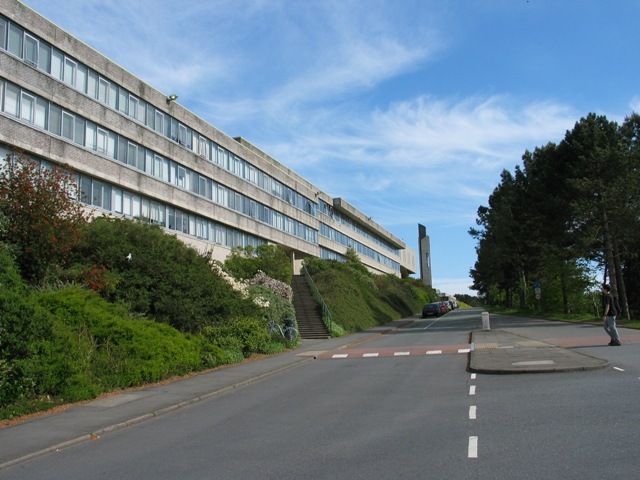 Aberystwyth could shine for its exceptional 20th century landscape. It is an opportunity lost. 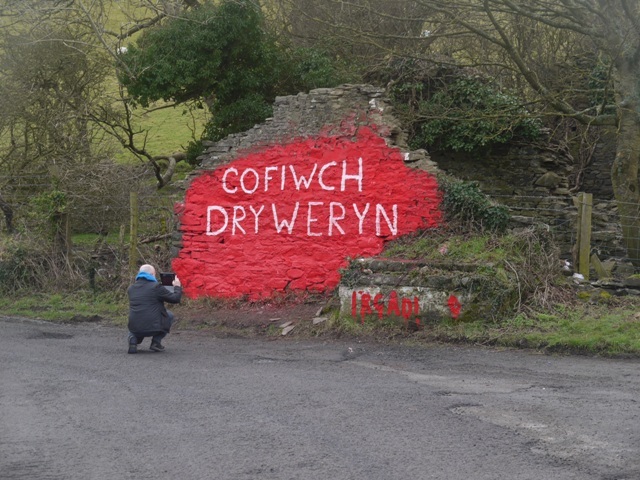 Following my recent much-read blog about the vandalism and prompt repainting of the Cofiwch Dryweryn wall near Llanrhystud several readers contributed comments on the familiar Elvis rock just over the Ceredigion border on the A44 at Eisteddfa Gurig which the unknown vandals appeared to be copying. This too, is a reinstated version of a modified graffiti message. 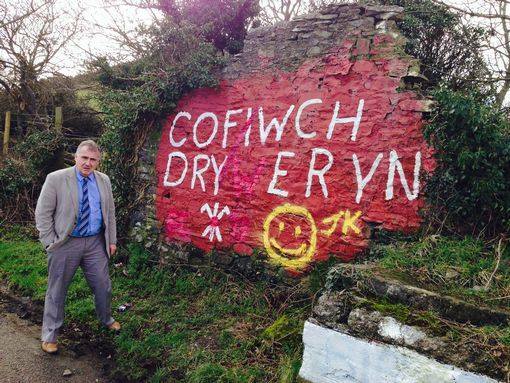 Originally painted on the rock in 1962 it represented electioneering support for Islwyn Ffoulkes Ellis, the Plaid Cymru candidate in a by-election. This being the legal name bestowed upon him at birth in 1924 it was necessarily spelled thus on the electioneering literature and the hoardings. But he was not a successful candidate and is much better known as the Lampeter University academic and prominent Welsh author Islwyn Ffowc Elis. This historic detail solves a problem which has long perplexed me: How do you find the space to amend Elis to Elvis? The original ‘Elvis’ has also been destroyed in the interim and has been repainted on a freshly cut face of rock. Now it sports an expansive V wider than the rest of the lettering, as my picture shows. According to Gwylim writing last month in Ein Gwlad, the original artists of the original ‘Ellis’ were the late film director John Hefin and David Meredith, former Head of Press and PR at HTV and S4C. 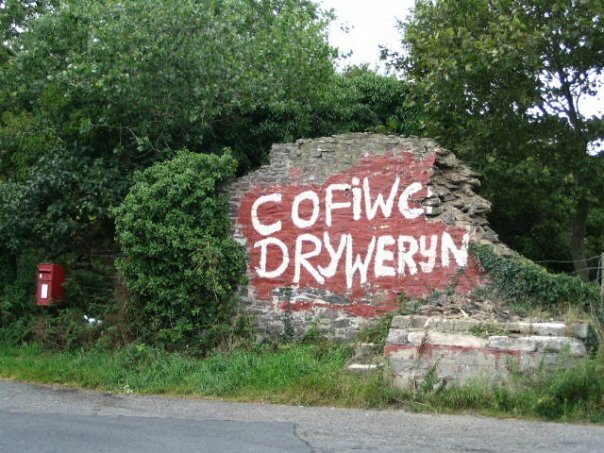 The original author of Cofiwch Dryweryn was the late Professor Mike ( later spelled Meic) Stevens. What a talented and scholarly lot these graffiti writers became! Did they already consider themselves men of letters in their nationalist-slogan writing days? 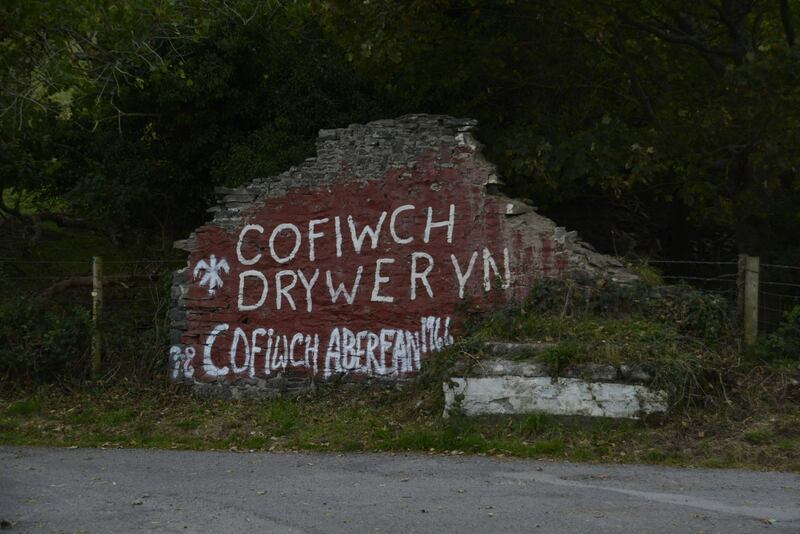 I learnt on the Welsh News on Sunday that the graffiti on the wall beside to A487 just north of Llanrhystud has been vandalised once again, so I took a detour there today. 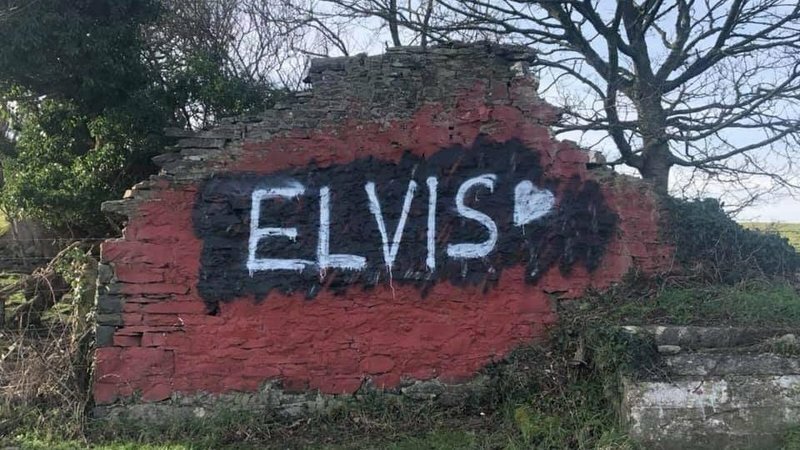 Imagine my surprise to find that the new daubing ‘Elvis’ and a heart has already disappeared, to be replaced by the original message. It has become quite a tourist attraction. As I pulled into the adjoining layby I found another pilgrim like myself already bent on photography! Passers by are stopping to admire the freshly repainted wall. 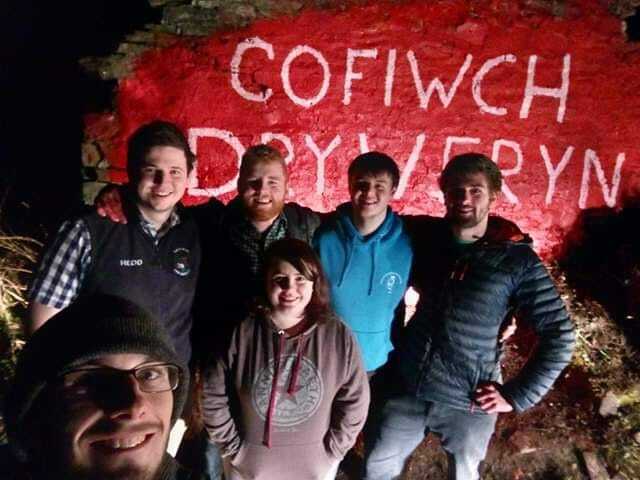 A quick search of Facebook reveals that a newly formed group styling themselves Welsh Independence Memes for Angry Welsh Teens lost no time in obliterating the substitution, toiling through the night to reinstate the old message. How much more satisfactory than a ponderous debate with the Authorities as to how and with whose money the restitution should be made! It is evocative of the original creation of the memorial, by a young Welsh Nationalist student at Aberystwyth University in the 1960s. It is a less known fact that that original young artist was one Meic Stevens, who died recently, having risen to the heights of Professor of Welsh Writing in English at The University of Glamorgan, a prolific author and Editor of The New Companion to Welsh Literature! Meic’s artwork was prompted by the flooding of the village of Capel Celyn to create the Tryweryn Reservoir in 1965. 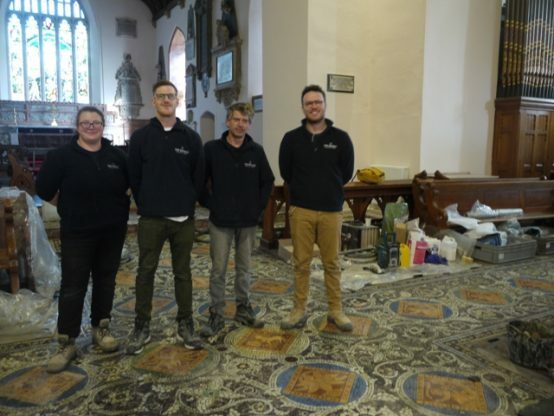 I can think of no better aide-memoir than a little snippet of British Film Institute video which records the last event at Capel Curig School and the last wedding, in 1963 at its chapel, while the earthmovers create a great scar in the background. Everyone in their best clothes, the ladies in their hats and heels, little girls in their summer dresses, boys in in their blazers and ties. It evokes a distant past. As the years passed the wall crumbled at one end, and the H disappeared entirely. One could still draw in and post a letter there, though that opportunity has gone today. It was touched up from time to time but it is in the present century that there have been successive attacks on the roadside memorial. In 2010 it was partially painted over to display an blobby ambiguous tag. In 2013 MP Mark Williams posed in front if it wearing an expression of grim concern. The perpetrators thought the obliterated letter W and the smiley face an amusing joke. The wall was repainted in 2013 with the original message. The next addition was at least more politically relevant ” Remember Aberfan was appended and this remained for several years. 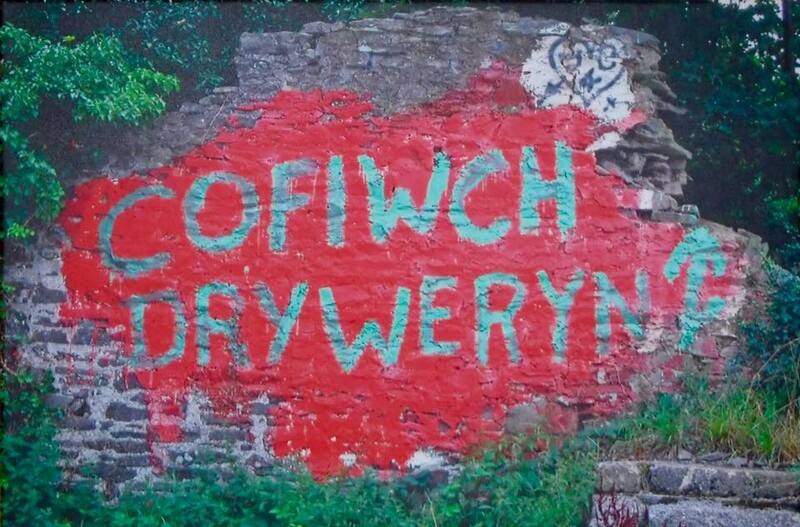 More recently the lettering was redone, in green rather than the original white, perhaps to emphasize the Welsh colours. Last weekend’s morph was perhaps the least creative. 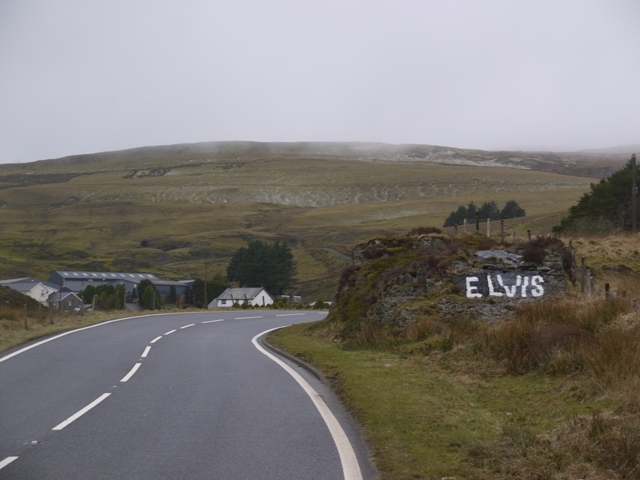 The new daub seems superfluous – we already have the well known Elvis rock at Eisteddfa Gurig. A second ‘Elvis’ lacks the historical relevance of the first, which was a corruption of the electioneering notice for Councillor Elis. One wonders exactly what the author of thinking of. 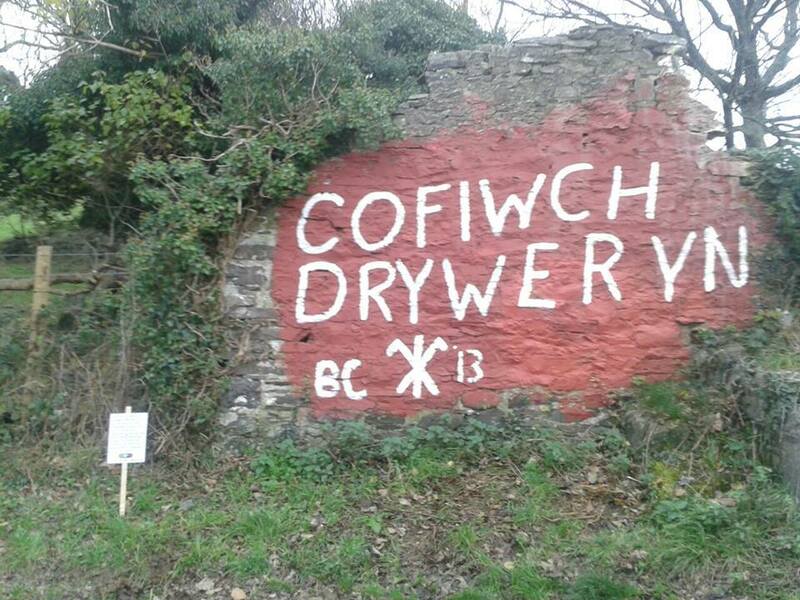 The Cofiwch Dryweryn wall as it appeared on 1 of February 2019, but was promptly obliterated. But is physical protection really the way forward? The immediate independent action to repaint the memorial is surely far more dynamic history than is putting up a fence! Though I suppose a video camera could reveal, to the embarrassment of many, the full range of activities to which a roadside layby can be put. A few years ago I was lucky to view the interior of one of the finest houses on the Tenby seafront, no 1 Lexden Terrace, a Grade II* listed building which was, at the time, the home of Mrs Marion Hutton. Six house make up Lexden Terrace, overlooking the sands at Tenby. No 1 is at the right. 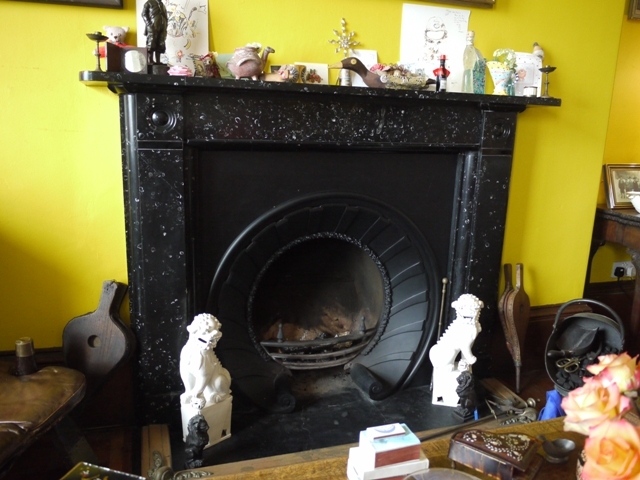 The five storey house was a treasure trove of antiques and objets collected in her lifetime, but my particular attention was drawn to a fire surround, made of polished black stone ornamented with white fossils. 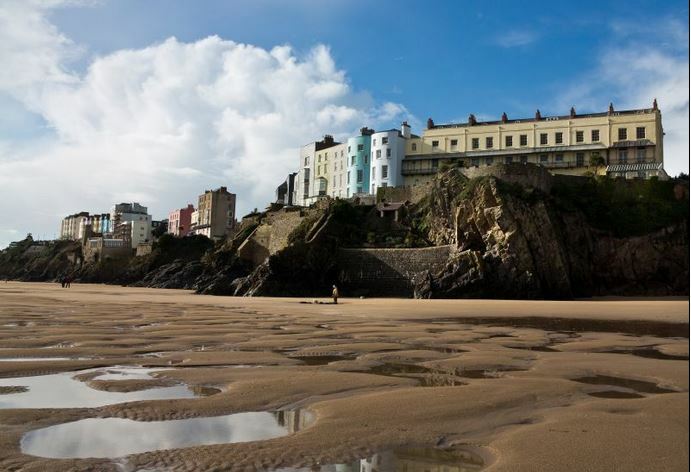 This and much else of the interior dates back to the 1840s when sea captain John Rees of Tenby, enriched by his trading activities in the Chinese Opium Wars, built not one but five handsome houses set on an outcrop above Castle Sands. Number 1 was his home, while numbers 2-5 were then, as they are today, upmarket holiday lets. 1 Lexden Terrace, Tenby: Snowdrop Marble fire surround. 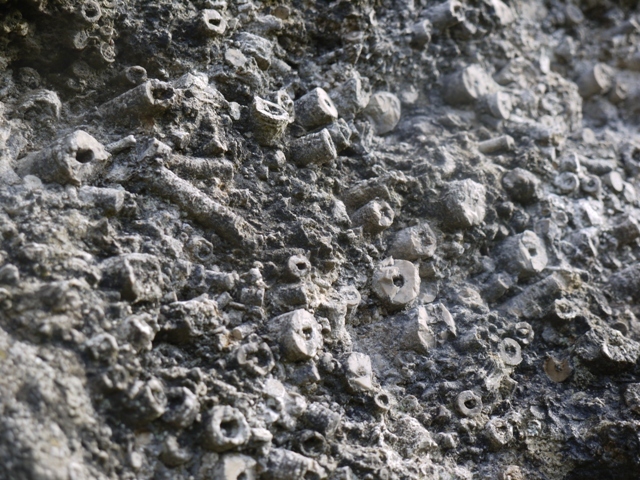 The brachiopod shells sliced in section look a little like snowdrop blooms. 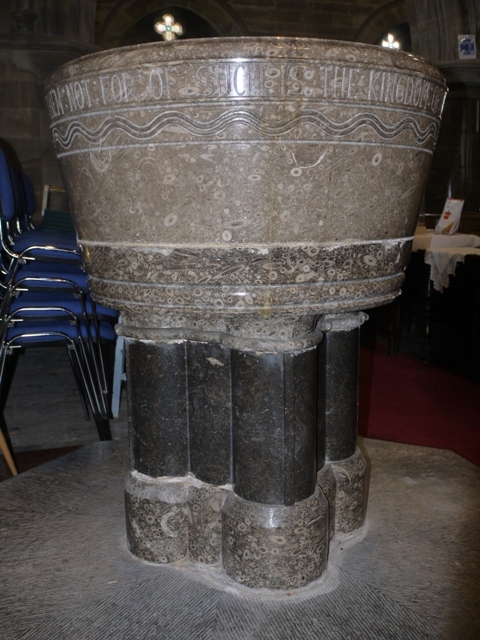 The stone probably came from the Pwll Quarry, just inland from Pendine. Leslie Baker Jones ( Trans Carms. 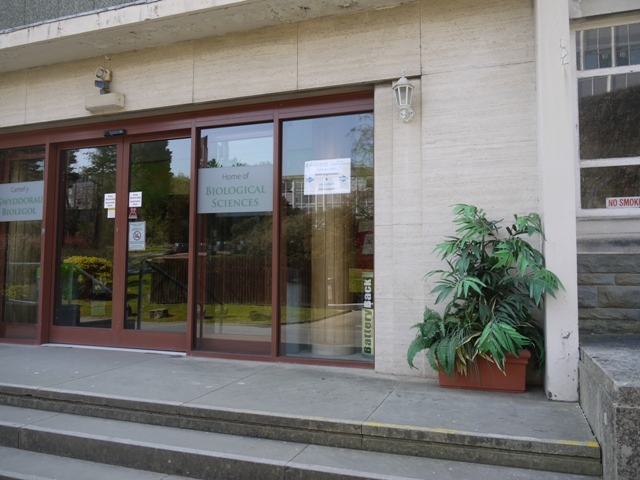 Antiquarian Soc. 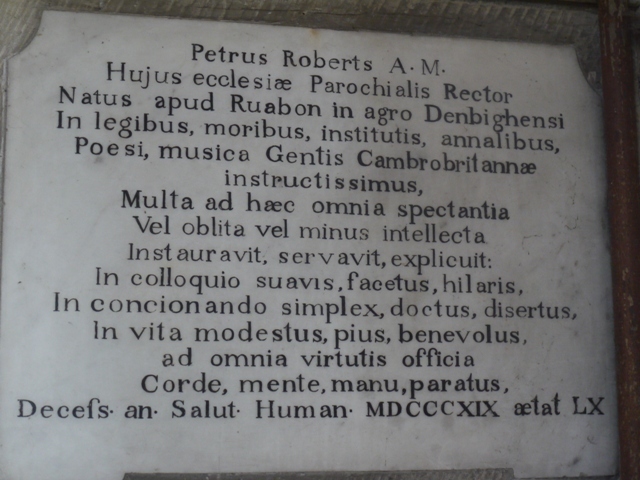 1971) has written about the monumental mason, Tom Morris of Pendine, who lived 1804 -1886, and whose career with Messrs Rogers, Marble Masons of Tenby involved the manufacture of funeral slabs, mantelpieces, tables and other domestic adornments. 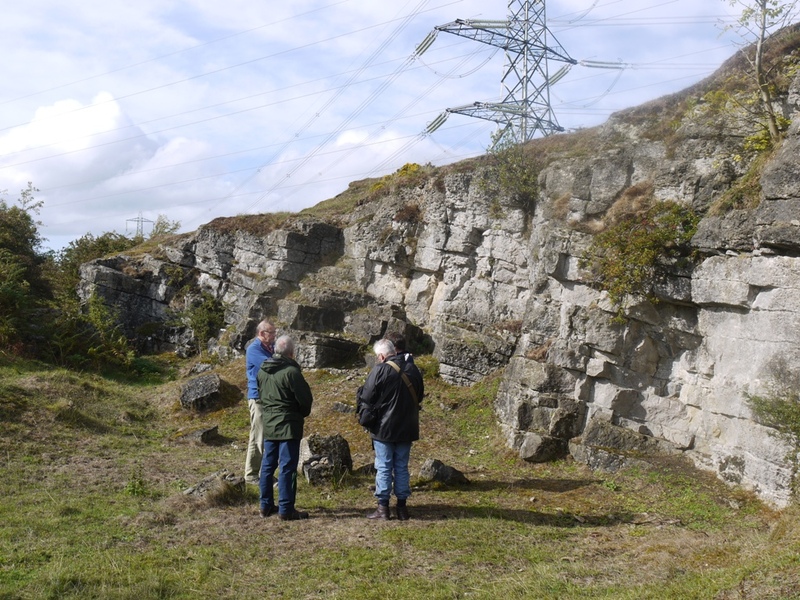 Morris felt Pwll Quarry yielded the best Snowdrop Marble, as it was called, though there were other nearby sources exploited in the 19th century, at Carew Newton to the the west and at Llanddarog and Llangynderyn, to the north east of Kidwelly. A detail of the over mantel. Where the internal structure of the brachiopod is cut through showing the forked spondylium, the resemblance to a snowdrop bloom is strongest. 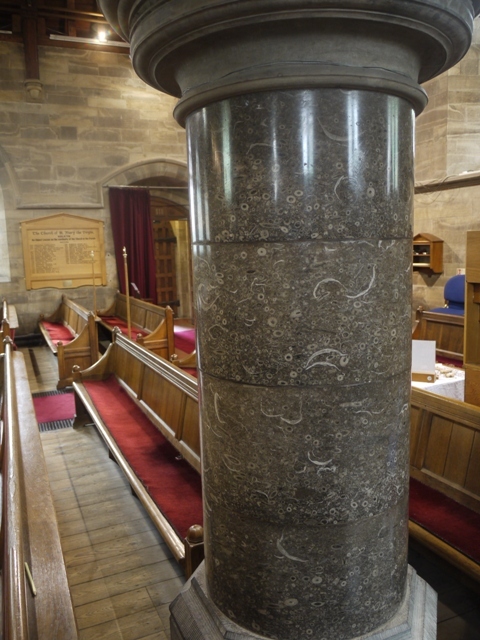 This distinctive stone occurs only locally and is of Carboniferous age, and was variously marketed as Black and White marble, Snowdrop marble, and as Welsh Black ( the last perhaps describing layers less rich in the distinctive fossils). 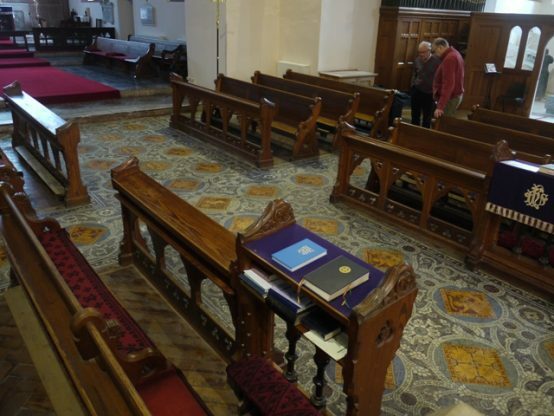 In St Mary’s Church, Tenby we found examples on grave slabs going back as far as 1788. 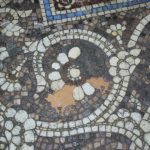 In the great outdoors it has fared less well, for the acidity in the rain has destroyed the polish, such that the fossils are only clearly visible when wet. 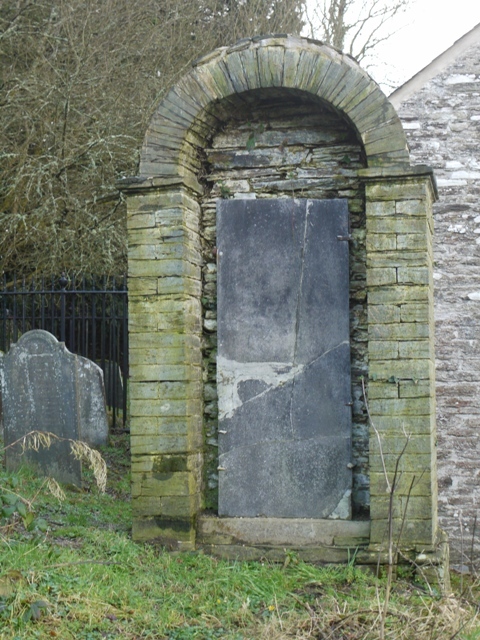 At Manordeifi Church, Llechryd it is easy to overlook a massive inscribed slab, cramped in a vertical setting within a sheltering arch of masonry. Shelter has done it little good, but close inspection shows the speckled appearance to be due to the mass of “snowdrops” or rather brachiopods in the stone. 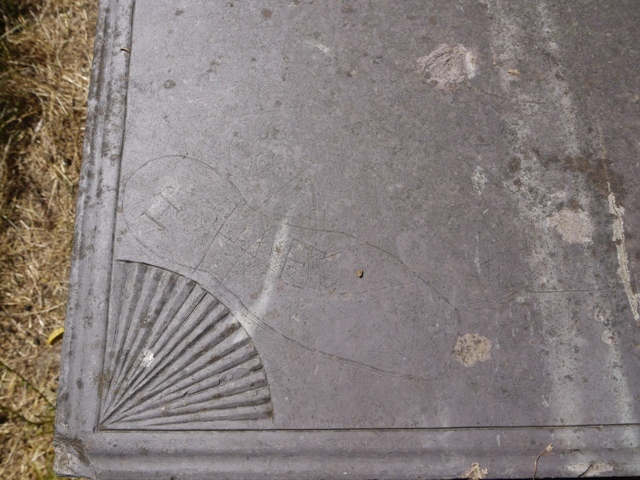 Another grave, at St Florence, Pembrokeshire was once highly ornamental, but its richly fossiliferous appearance and colour contrast are lost without the polish. 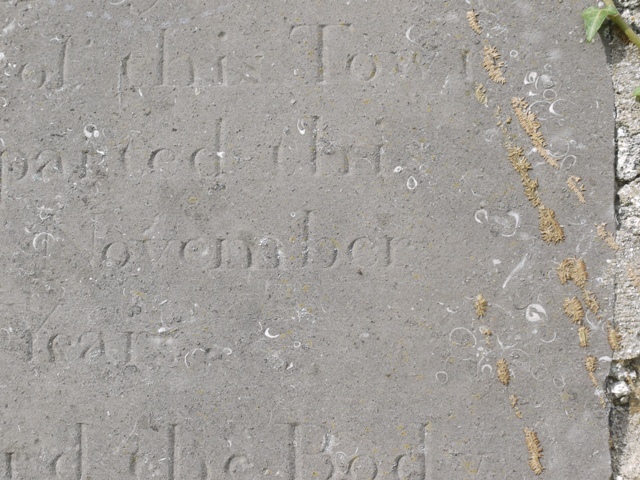 And at St Mary’s Church, Kidwelly we found another example, in a memorial set into the church wall, showing the characteristic scattering of shells. 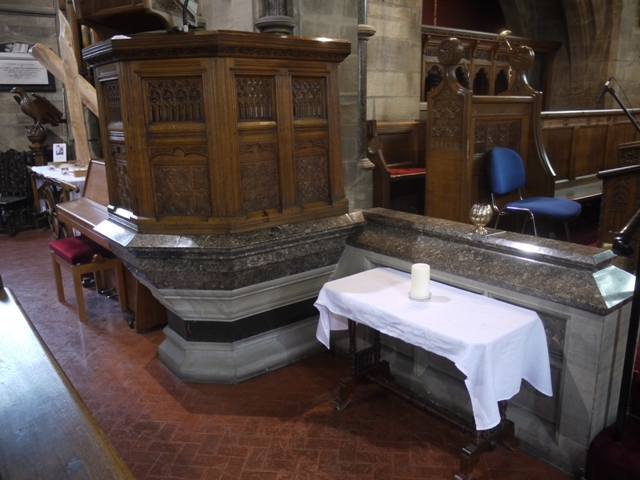 These slabs, when new and highly polished must have stood out in the graveyards much as the impermeable Indian black granite memorials do today among the less showy slate and stone. Only indoors can snowdrop marble survive the ravages of time. As a material for a modern worktop Snowdrop Marble would be beautiful, but it would be vulnerable to etching by lemon juice or vinegar in the kitchen. Nonetheless it is a pity that this distinctive Welsh stone is no longer produced for ornamental purposes. Coming next: Halkyn Marble, another distinctive Welsh marble from the north! 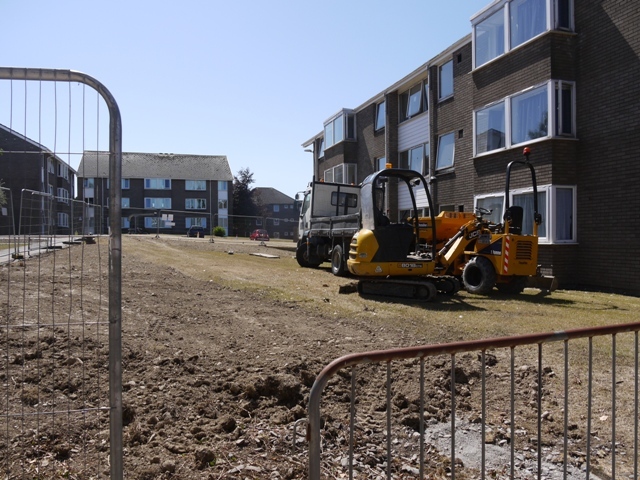 Graduation is past, the students are gone for the summer, so the Aberystwyth University Estates Department is once again ramping up their programme of landscape destruction. 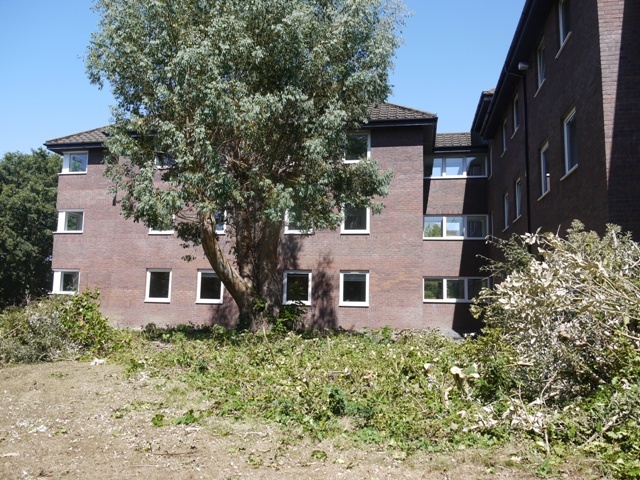 Last summer saw the disappearance of several important shrub plantings including the long stretch below the Hugh Owen Library. We have had plenty of time to savour the results of that. Brambles and weeds now flourish in the optimistically spread bark mulch on the slope, the so-called-wildflower planting has been strimmed down to its brown dead stems, and in the present hot summer, the grass and new turf has, understandably, taken on the appearance of the savannah. There is a particular irony in the observation that while we ordinary folk stopped mowing our lawns six weeks ago because they weren’t growing, the University’s contractors’ machines have passed repeatedly over the ground during those weeks, kicking up clouds of dust and barely a blade of grass. That is what happens when you put your lawn mowing out to contract in Shrewsbury. 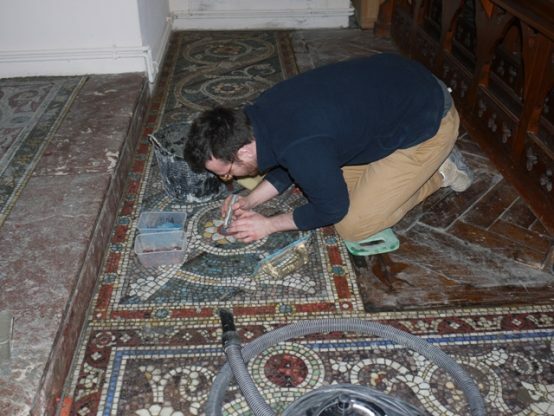 Specialists contractors cannot be redeployed to do something useful, as in-house staff could have been. They were employed to mow lawns. The mature plantings of deep rooted shrubs hold up better in the drought. The welcome shade is enlivened by the diversity of tone and texture. 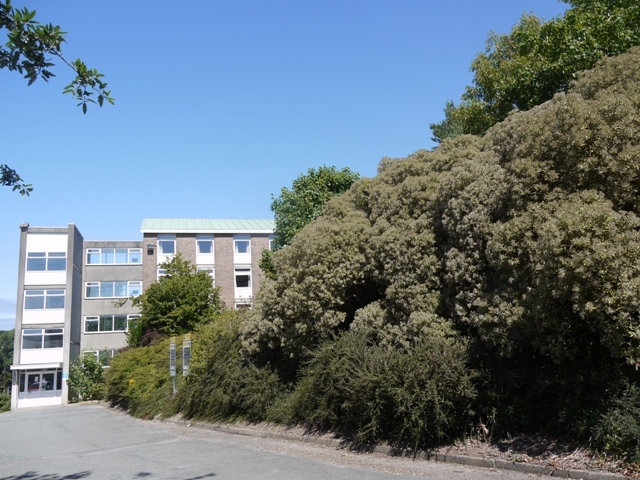 You could look across a parched lawn to the dense glossy green of holly, cotoneaster, and escallonia, the sculptural leaves of viburnum or choisya, the dusty grey-green mounds of Olearia about to burst into flower, the dark feathers of low growing juniper. Or you could. 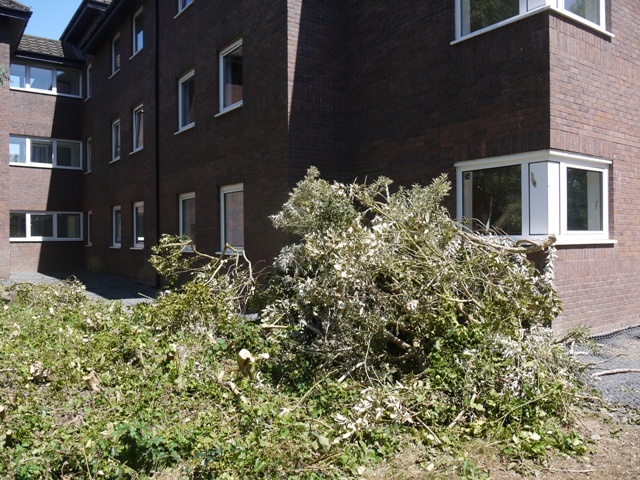 A new outbreak of needless destruction is taking place around the presently unoccupied halls of Cwrt Mawr and Rosser. As I approached the Cwrt Mawr Hub I was astounded to find the tightly pruned bushy heads of an entire hedge of hollies lying scattered on the ground. 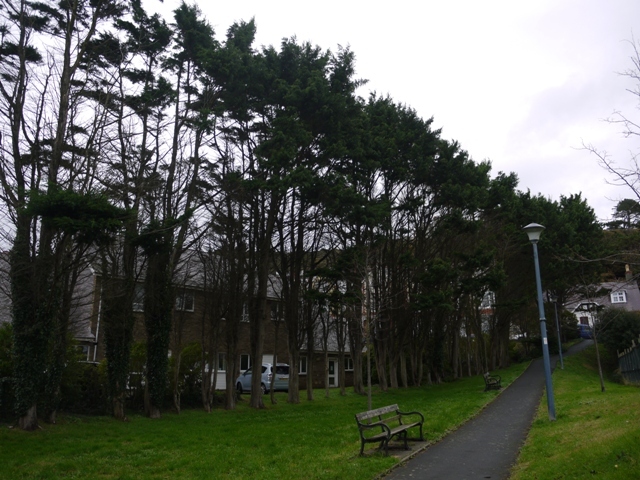 The trees, each with trunks about six inches in diameter, have been sawn off above ground. 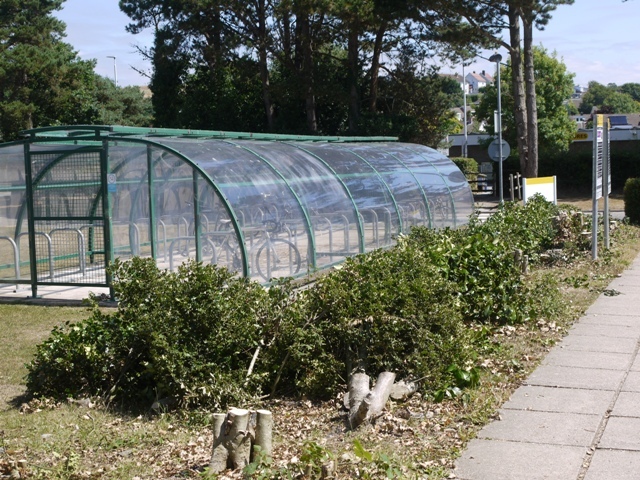 It had been a blameless hedge, less than chest high and well tended, and it screened a long plastic bike shelter. Strolling further among the buildings of Cwrt Mawr, things get worse. Some destruction may have been necessary due to work upon a water main, but the damage is far worse than that. There is clearly a philosophy here. Where a border formerly stood, there shall be just one tree, denuded as far as possible of its lower branches. Around Rosser I found more borders had just been destroyed. The sad mounds of destroyed shrubs lay inn heaps beside the stumps. Here, not yet wilted, were the boughs of evergreen choisya, olearias about to bloom, azaleas in tight bud with next spring’s blooms, cotoneasters, purple and green leaved berberis. In one border the designated survivor is a Eucalyptus, in another it is a sorbus. In the furthest border there are no designated survivors. The penitentary style of the buildings has a new brutality. Cwrt Mawr. The heap on the left is of azalea, pieris and juniper. 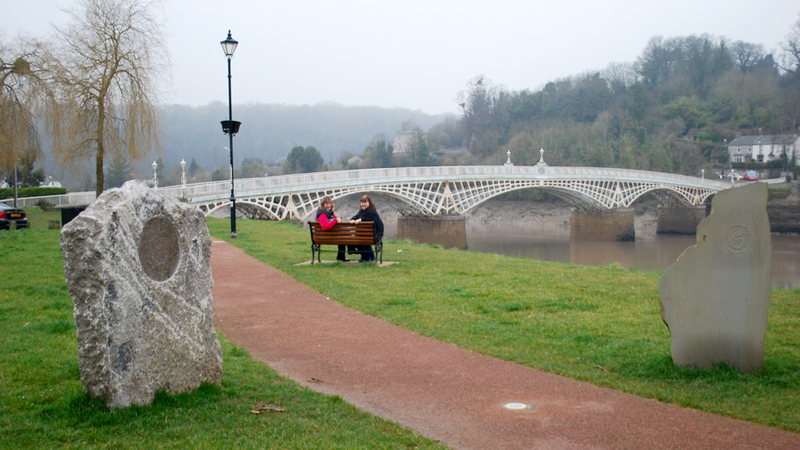 Rosser – Another harmless border destroyed to enhance the view? 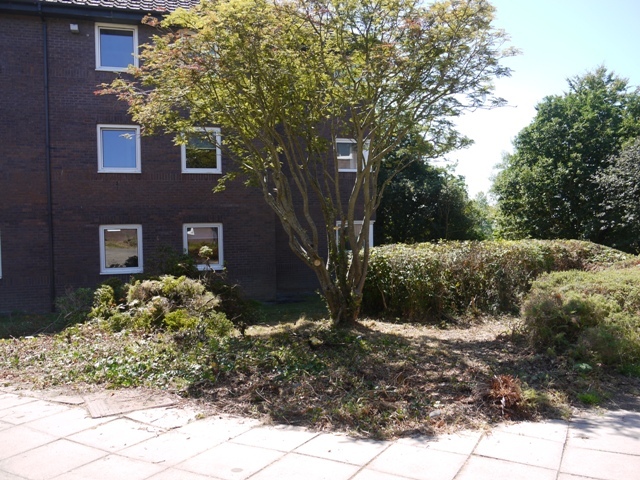 It is no secret that the Estates Department’s decision-makers have no horticultural or landscape design qualifications. It is they, and external contractors appointed by them who are wreaking this havoc. How they imagine it will make Rosser and Cwrt Mawr more attractive to students and their parents I have no idea. It is depressing to write so dismal a piece. 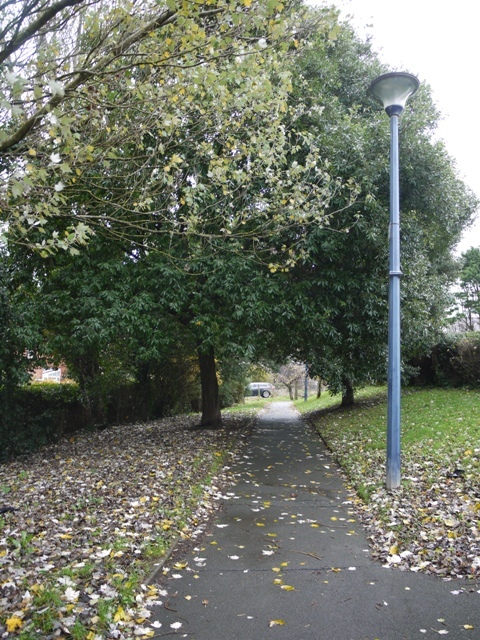 I close with another picture taken today, of the cul-de-sac leading to Penbryn 7 Here we see the towering glory of mature olearias cotoneasters and berberis clothing a steep bank, immaculate and maintenance-free. It is for this sort of quality that Cadw awarded the campus a II* listing twenty-five years ago How long, though, will it survive an administration intent on destroying heritage? The approach to Penbryn 7, glorious planting interrupted only by the ubiquitous new parking notices. 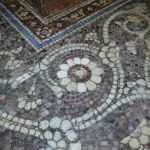 Following my last blog, a reader who goes on excursions with the Church Monuments Society has drawn my attention to another, much grander, chest tomb ornamented with footprints. 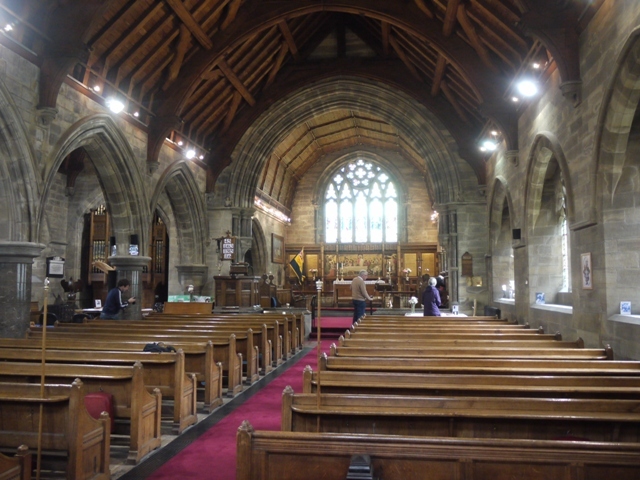 This is in East Yorkshire, in the 13th century church of St Nicholas, Hornsea. Here the chest tomb of Anthony St Quintin, a divine, who died in 1430, is densely ornamented with shoe outlines. 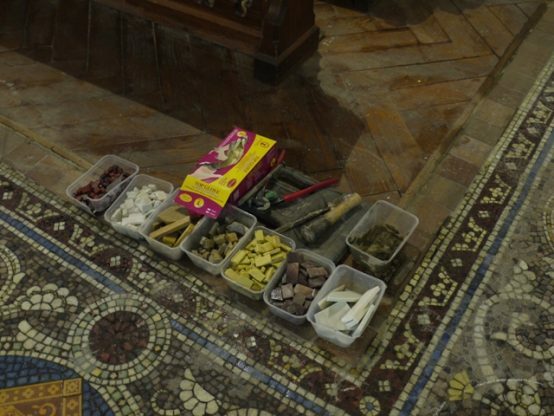 They were even easier to carve than those in Anna Maria Hughes’s slate slab, for this grand tomb is made of alabaster. 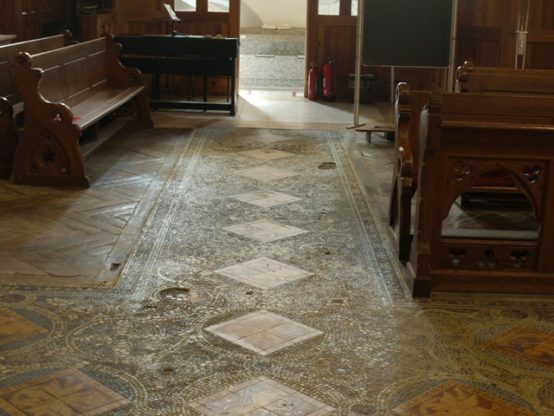 Interpretation in the church suggests that these are Puritan footprints, and that the shoe shapes are consistent with the time of Charles II. 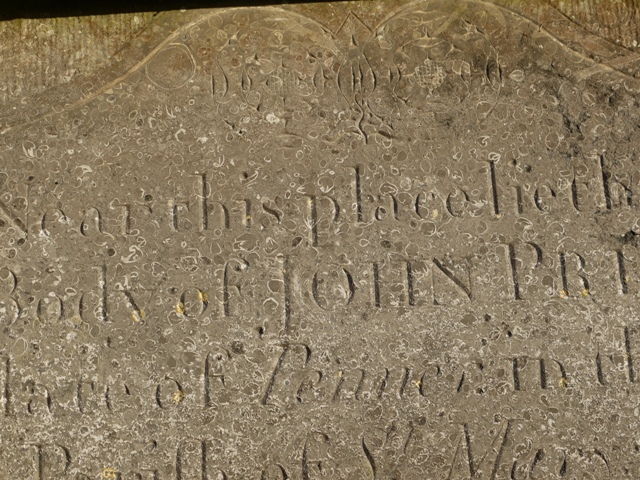 Such an explanation does not help us with the footprints on the grave of a Welsh girl who died in 1777. 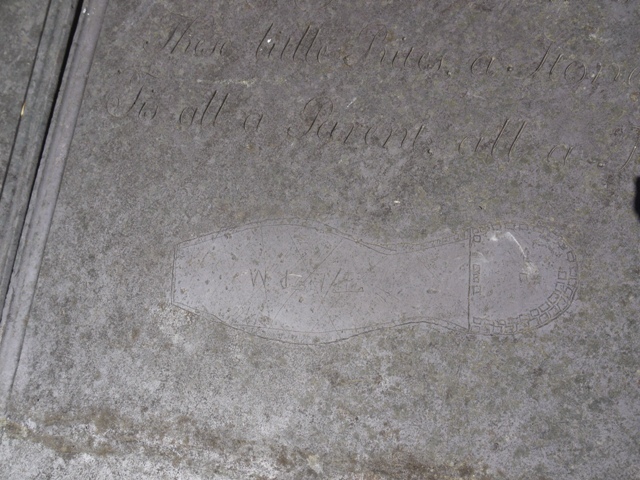 Two other readers have mentioned not footprints but hand-prints in Wales. 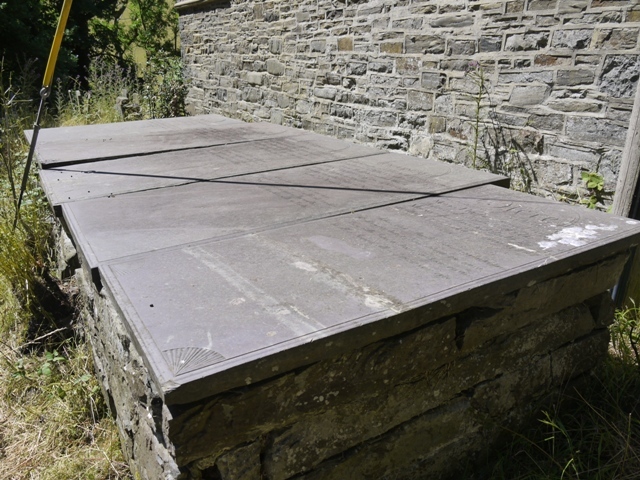 On a raised grave by the church door in Dolgellau are lots of children’s handprints of varying sizes, while there are life-size handprints around the top of the front boundary wall of the Quarry Hospital in Llanberis, Gwynedd. 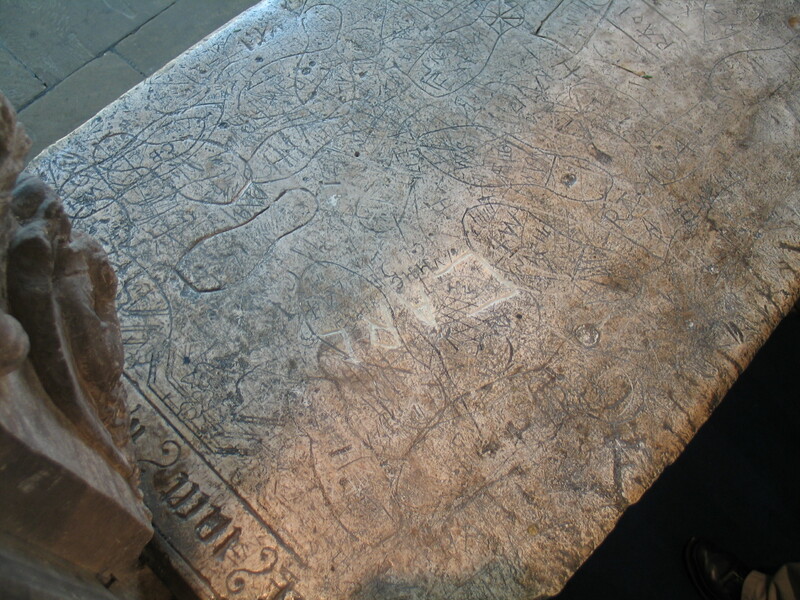 There may be several different stories behind these marks by which ordinary people left traces of their identity.